Used by athletes in the NFL, NCAA, and hundreds of high schools everywhere. Train like a fighter pilot. Play like a pro. 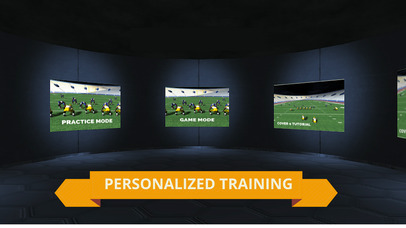 Turn your living room into your very own private training facility! From dominating a Cover 2 Defense to evading blitzing linebackers, experience Virtual Reality football training that will blow your mind. The SIDEKIQ Challenges are real live game action and interactive tutorials teaching you everything you need to know to be a successful football player. PLEASE NOTE! The SIDEKIQ Challenges are free to download and play, however some training tutorials have to be purchased with real money. ● Equivalent to a summer’s worth of professional training, camps, and lessons, a $5,000 value!